This step has you add the foam to the jig and glass the inside of the turtleback. April 10, 2004. Once the jig was done it was time to add the foam. The first strip is the easy one since there is no compound curve. Just lay it in place and secure. Here you see two strips. I tried to force the second strip but ended up removing it and making it fit better. The compound curves got in the way. April 10, 2004. 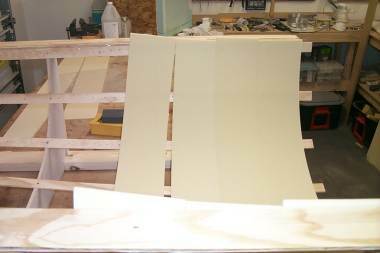 I decided to use the patented Wayne Hicks Drywall Screw method of attaching the foam to the jig. This works really well and avoids the usual glue divots. 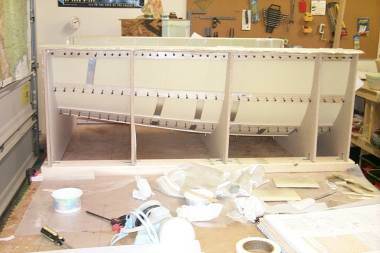 I predrilled holes in the three outer strips on each side of the jig. I used a drill bit just slightly smaller than the screws. Use fine threaded screws because they only have about 1/4" of foam to grab onto. April 11, 2004. Here is how I achieved zero gap seams between each piece of foam. 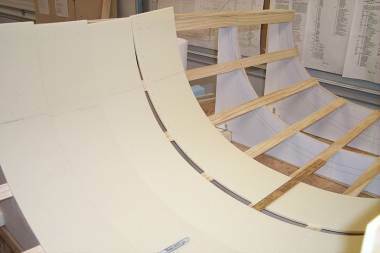 As you lay each 6" wide strip in the jig, it will want to curve such that the top touchs the previous piece but the bottom, middle section wants to be a half inch or so away. Find the best position such that the top just touches and there are no "buckles" in the foam. Now simply measure the width of the gap at the bottom. This should be the widest gap point. Now mark this measurement from end to end of the new strip every inch or so. 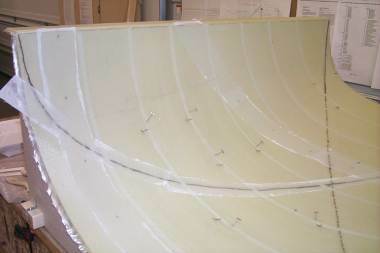 You are measuring from the aft edge of the previous strip onto the leading edge of the new strip. When done, remove the new piece and lay it flat. You should see that the marks actually form a slight curve. 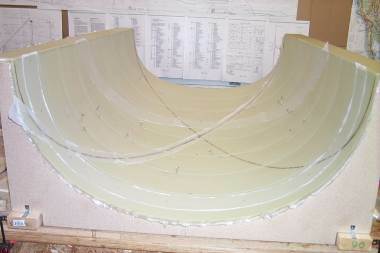 Now cut and sand to this curve. You should remove the most foam at the ends and no foam in the center. Once sanded, put back in place and you should get a good fit with no gaps. April 11, 2004. 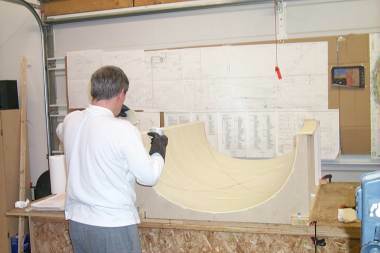 A side shot of laying the next piece in place to measure how much foam to cut away. April 15, 2004. Here you can see all the drywall screws in place holding all the foam. You will also notice some metal strips in various places. I thought I could get by without using the metal strips. I came close but in the end I had a few spots where the foam seams weren't quite right. I had bought a roll of 3" metal flashing from Home Depot. I used some tin snips to cut the flashing into 1" strips. I then cut lengths that would span one or two of the wood strips. I then slid the metal strips between the foam and wood where needed. April 15, 2004. 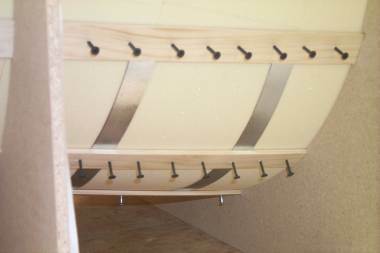 A close-up of one area showing the screws and metal strips. April 15, 2004. Another shot of the jig. 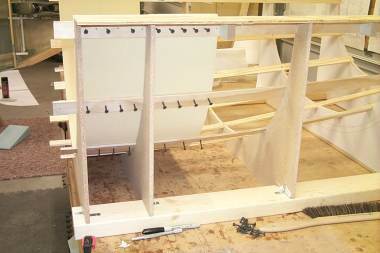 You may notice two small wood blocks at the top of the jig. After I added the horizontal members, I found that the top wood strip didn't quite follow the same contour as the shelf. I screwed the block to the top and then screwed the wood strip to the block to get it just right. I just needed the two blocks on the one side, the other side was fine. April 17, 2004. A shot of me working in the inside layup. George came over to help get the glass layed out straight. April 17, 2004. The completed inside layup. 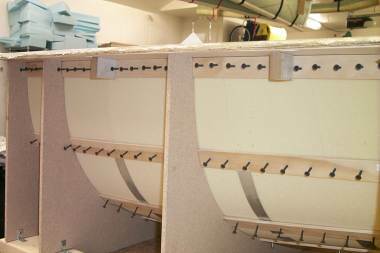 You can just see the two strips of peel ply - one for the TB-1 bulkhead and the other for the drip rail. Following the FAQ on the cozybuilders.org site, I jumped ahead and roughly measured the location of these two items ahead of time so I knew where to add the peel ply. Oh yeah, the third strip of peel ply is for the glass seam between the two plies of UNI. April 17, 2004. Another shot of the complete inside. You can see the 1/2" strips of masking tape under the glass. This turned out to be a pain. It doesn't stick to the foam and in some spots, I couldn't get it to lay down even after completing the layup - it was lifting the glass off of the foam. In a panic I tried to figure a way to solve this problem. I had about 9 spots total where the glass was lifted off of the foam. These were areas about 1" x 2" or 3" in size. Weight wouldn't work well due to the curve, they would all slide to the bottom. Finally the simple solution popped into my head - straight pins. I stuck 2 or 3 pins into the glass and foam at an angle forcing the glass and tape down onto the foam. It worked - mostly. In the end I had a couple of small bubbles I will need to fix later. The trick is to ensure there is lots of slack in the masking tape. It's very easy to pull a little tension on it as you put it in place. 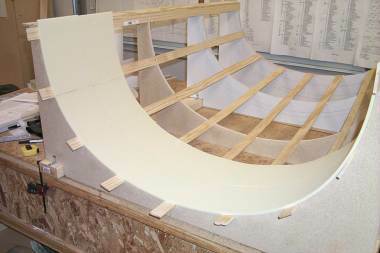 Due to the curve, it naturally pulls itself up off of the foam. I suggest you put the tape on and wait for the next day to glass. If the tape pulls up over night you can reapply that piece to get it right. Better than it lifting glass up that night instead.